Recently, we read a story called The Paper Bag Princess by Robert Munsch; the well-loved author of Love You Forever and many other wonderful stories. In the story, Princess Elizabeth is described as a beautiful young princess who lives in a lovely castle, has beautiful hair, and expensive clothes. She is betrothed to her perfect match, Prince Ronald. Until one day when a dragon comes along and smashes her castle, burns up all her fancy clothes with his fiery breath, and captures Prince Ronald. Princess Elizabeth decided to put on the only thing that survived the fire (a paper bag) and sets off to save her prince. When Elizabeth finally meets the dragon, she uses several very sneaky tactics to trick the dragon into exhaustion. Once the dragon is out cold, she rushes in to save Prince Ronald, but he scoffs at her appearance and choice of clothing. He tells her to go away and not to come back until she looks like a “real” princess. Elizabeth smiles and says, “Ronald, your clothes are really pretty and your hair is very neat. You look like a real prince, but you are a bum,” and Princess Elizabeth decides not to marry him after all. After the story, we discussed why Princess Elizabeth decided not to marry Prince Ronald. Many of the students concluded that Ronald was not very nice to her and that she should be allowed to wear/look however she wants. Others decided that sometimes, the princess gets dirty and saves the prince. One child even stated that it doesn’t matter what clothes a person wears, what matters is that they are a nice person. We decided as a class that it’s fun to imagine and tell lots of different stories. Boys can pretend to be princesses and fairies. Girls can pretend to be princes and dragons or maybe just a princess who likes to get dirty every once in a while. When we play, we can be anything our minds can dream up and the true moral of the story is that life isn’t much different. Regardless of our age or gender, we can be anything we wish to be if we just spend a little bit of time imagining. The world of technology is ever-changing. Children as young as a few months old are now able to navigate their way through iPads, Kindles, and smart phones better than some of their adult counterparts. And while technology is a great tool to utilize in the classroom, sometimes a little bit of imagination can create a world of fun and possibilities. Yesterday, our class decided to create their own versions of these technological advances using some cardboard, paper, and a few markers. Each child had a clear plan of what they wanted their device to look like, some including their protective cases. You got to love their ingenuity. So far in our bird unit we have learned about what different birds look like, what they eat, where they live, and the sounds that they make. Last week we extended our affinity for birds by having the students create their own birds and all the details that go along with them. 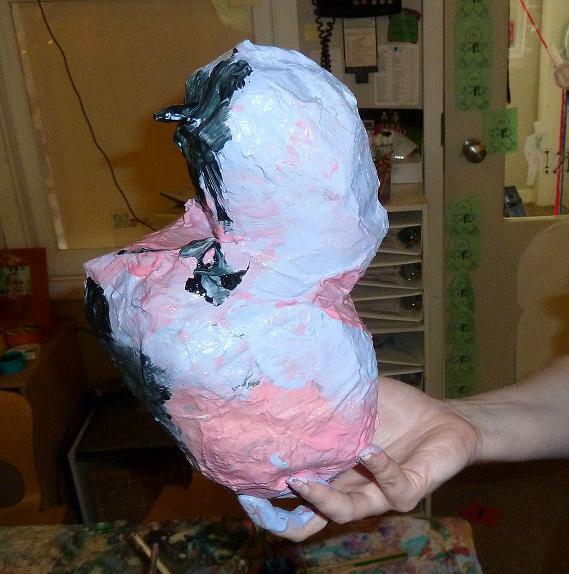 The students started by rolling up newspaper into different sizes and taping them together to resemble a head, body, beaks, and even a tail. 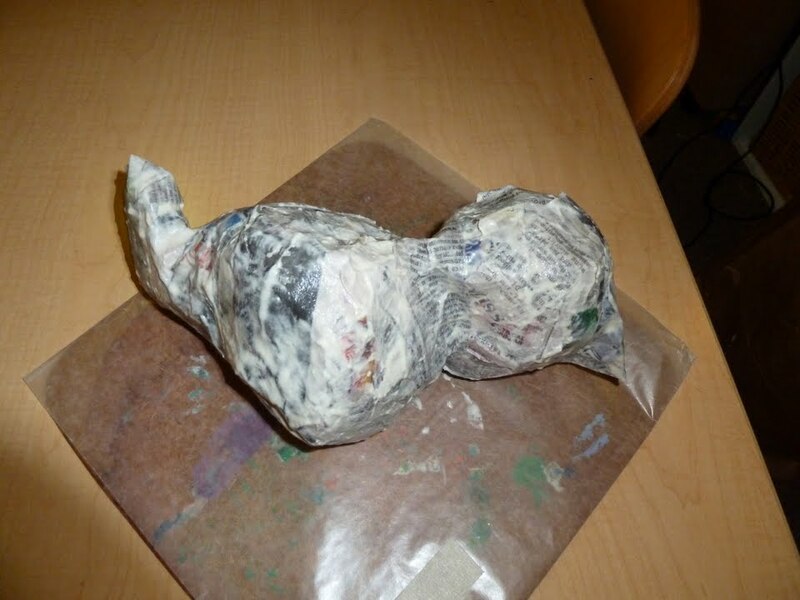 After the base of the body was ready, the students dipped strips of newspaper into a mixture of water and flour and smoothed them onto their bird. Some students loved the feeling of the ooey gooey mixture between their fingers (that eventually crept up their arms) while others were not as enthused. Some students felt they would best serve the project by becoming the recorder, documenting each step of the project through drawings. The projects were then left to dry over several days. Since then, the students have started to discuss how they would like the birds to look. The group members decide what colors of paint to use and where, what to call the bird, if it is a male or female, where it might live, and what it eats. Not only are the students working on their cooperation skills, but they are using their imaginations to create a world in which these birds may live. 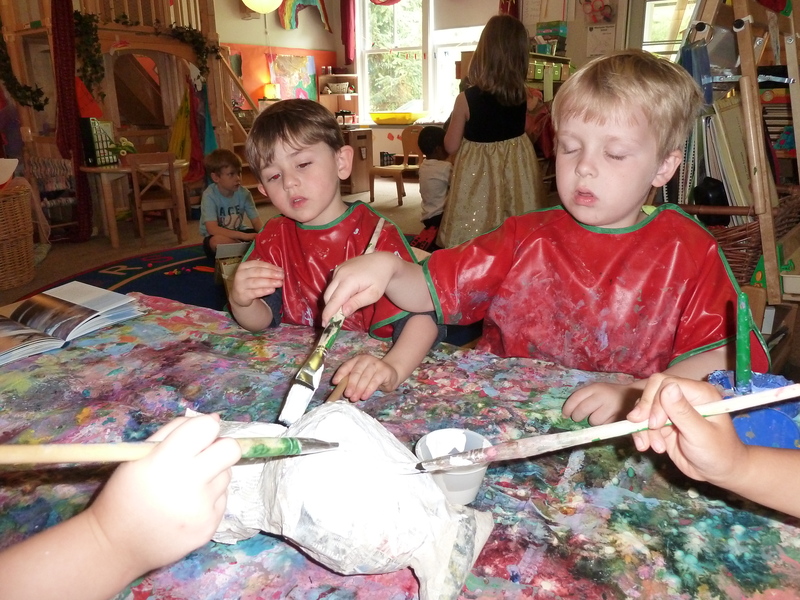 Plus, who could resist the opportunity to get a little messy and learn at the same time?